Do you have a favourite game show? Do you prefer the ones that are purely games of chance, games of skill, or a combination of the two? American Wheel of Fortune. Public Domain. I prefer the quiz type shows where you can shout the answers at the tv. I quite like the ones with no real money at stake, like the Einstein Factor, where people answer questions on whatever subject they're interested in (anything from physics to Xena Warrior Princess). Eggheads. The show has a subdued understatement about it that appeals to me. 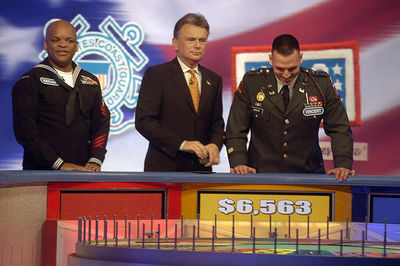 I usually prefer general knowledge game shows. I used to like Who Wants to be a Millionaire?, but would rarely choose to watch it these days. Current game shows I sometimes enjoy are Pointless and The Million Pound Drop. I also like The Eggheads. I like shows that test my knowledge such as Jeopardy. Family Feud because you have a chance to yell the answers and have the humour from the host and contestants. Family Feud is great, but too short. Some contestant's answers defy belief - and they usually have paid employment! That is weird. 'Millionaire Hot Seat', just view to increase my General Knowledge! We did like Eggheads, and I see SBS has been replaying old Letters & numbers - I rarely managed to 'win' there, no good at maths, and mostly too slow with the letters.